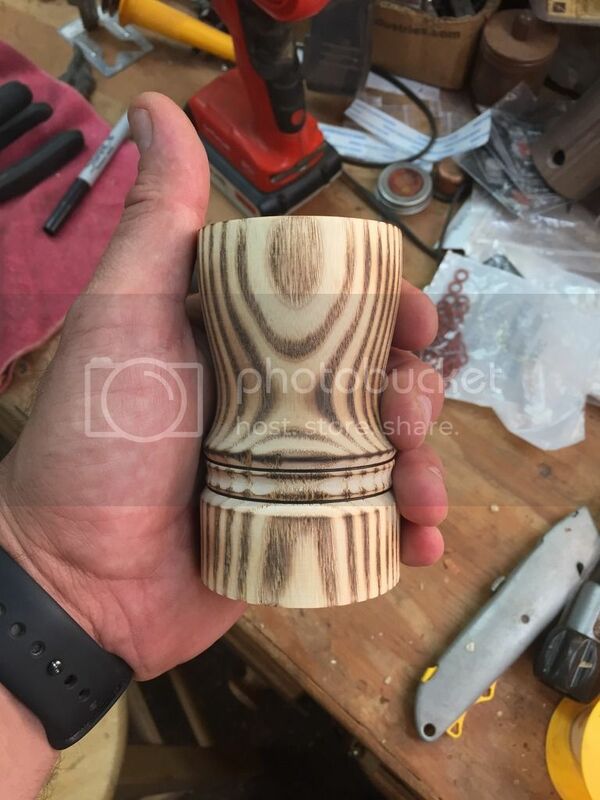 Alright, many of you may know, some may not, came to FC wanna say back in 09 by invite from a great guy that purchased a wooden dugout from me I think it was, he asked me if I could make a wooden vapor stem, I was intrigued and gave it some thought, one thing led to another, have been making wooden stems for various vapes for several years now. 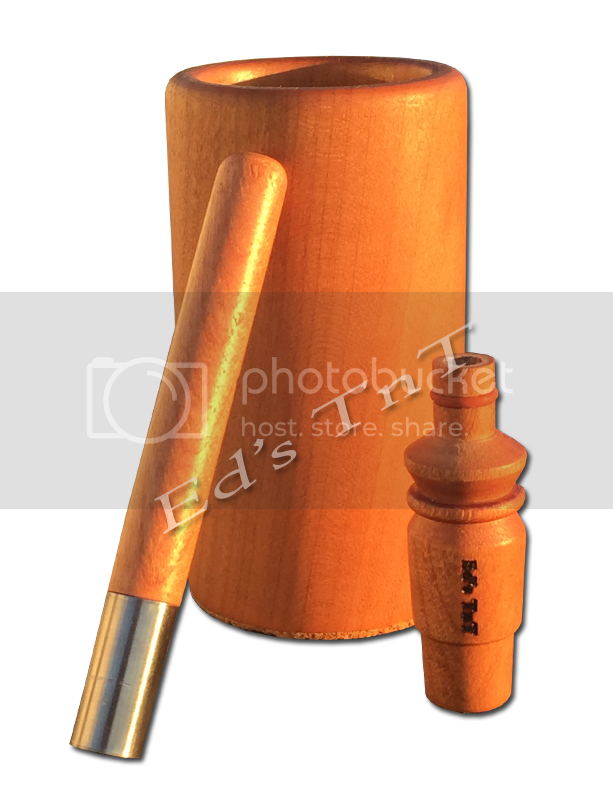 I have been fortunate to work for many many great people here at FC, a few great companies introducing and developing wooden stems, wongs and such for them, and so many of my customers through my site. I have been at FC for a while, have come to feel at home here with a family that I feel really close too. Have made so many friends here, most I have never met in person but would give them the shirt off my back and I am sure them me. 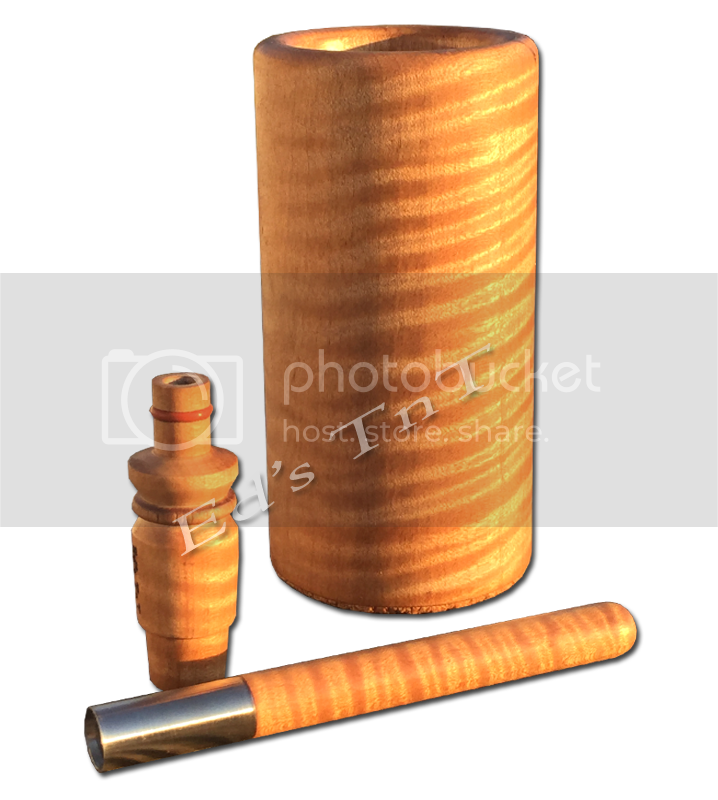 Anyhow, I have wanted to make a wooden vape since not long after I joined FC, I thought of this and that, tried both only to think up another this or that only to fail. I'd get sidetracked due to failure or a growing work load, for a while, I would give it another go then go off course yet again. That's no longer the case, I have made it happen, have bodies turned, heaters to install and hours of bench testing to do before the first of next week in order to get betas out. I am calling it the Vapor Bomb, that's what I tagged it way back when. Its simple to operate, you all that are already familiar with log vapes will find it to work similar to others out there. Its nothing more than a block of wood, a stainless steel air path, a cartridge heater soldered to the jack with 2 joints, it is what it is. Out the box with a standard 12v 2A power supply its running 410+or- a degree or two. I will be offering it soon enough after the betas make it out and findings are positive. I know there will be alot of questions and I will do my best to answer, pls keep in mind there is alot I have to consider and think about. There is alot that has to still be done but ohhhh its about time for me to pull up a chair at the grown folks table! Squiby, Fogoff, ichibaneye and 64 others like this. Don't get a lot of time to spent now (work..)....but I will check this thread, sure! Vapor_Eyes, Philreal187, Melting Pot and 3 others like this. Looks great Ed I'm glad that you managed to get these made up and will be tested soon enough by the good fellows here at FC, sure they will give you plenty of feedback on there observations. 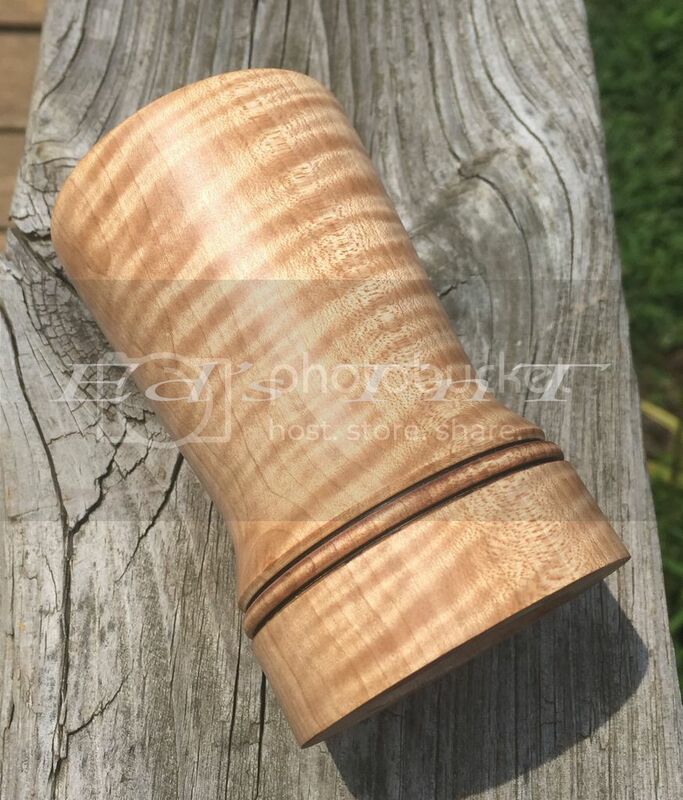 Been looking into getting a log vape to add to the Milaana I currently use weekly (or nightly if the desire takes me) so keeping it all wooden and natural would be great, a true centre piece for vaping adventures. What comes in the VB kit then? Mouthpieces, gongs etc? Vapor_Eyes, Philreal187, Melting Pot and 2 others like this. Vapor_Eyes, peaceonearth, nondarb and 8 others like this. I assume (hope to god) you'll be shipping these internationally, as I'll most certainly be wanting one. Vapor_Eyes, Philreal187, Melting Pot and 4 others like this. 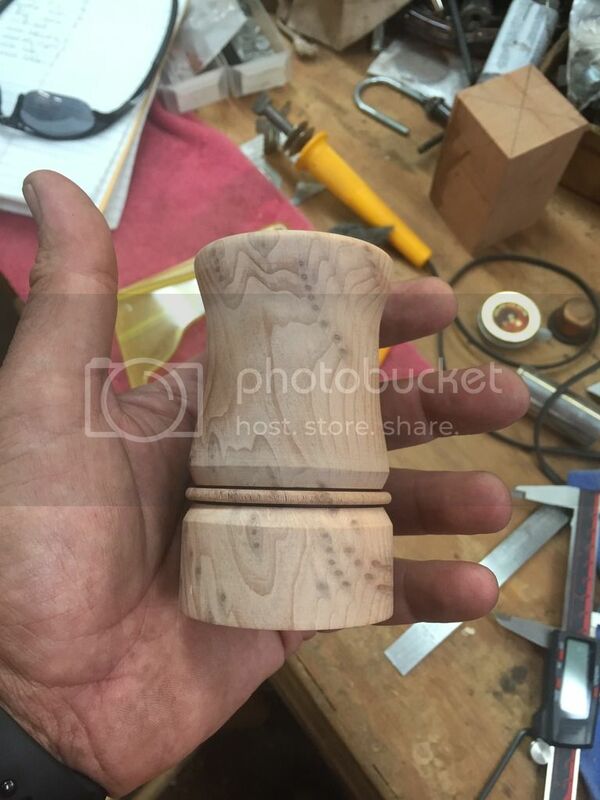 All looking really nice, that curly maple looks like it was photographed underwater with those ripples running thru it. turk, SSVUN~YAH, Vapor_Eyes and 7 others like this. I'm very interested Ed. Put me on the list to have one made. I will visit this thread often to see how things are going. Awesome news!! turk, whateverman, SSVUN~YAH and 8 others like this. Will You use a resistor or a dedicated SS heater? SSVUN~YAH, Vapor_Eyes, momofthegoons and 6 others like this. Glad to see you joining the fray. Sign me up for one, your work is always beautiful. Good work Ed! I'll be in line as well! Love my logs! RUDE BOY, Vapor_Eyes, Philreal187 and 4 others like this. SSVUN~YAH, Vapor_Eyes, Philreal187 and 3 others like this. SSVUN~YAH, Vapor_Eyes, Philreal187 and 4 others like this. OK Beta testers. You need to get your work done ASAP so the rest of us can get ours. Given the quality of Ed's wood working these are going to be the most beautiful logs. A new exciting adventure in the land of the logs! Well done Ed, they are all beautiful! This is so exciting. I've been saving and waiting to buy a log vap, and would love to buy one from you! They look wonderful! Can't wait to see more info and pictures. Congratulations on your new venture. Will these vapes be powered with a switching power source so it could work on 110-240 v? Vapor_Eyes, Philreal187 and Ed's TnT like this. Good morning everyone, I hope all is well and am so thankful and excited to see all yalls enthusiasm for the VB! I have been in the shop giving it hell, has been a busy couple of days with so much going on, I have even gotten behind a day or two with some betas. I got busy with my vvps project also for it, you all know well that I am a wood guy, I really have no knowledge of 12v electronics. I know how to wire a house, 110 is easy, but 12v boards are frustrating to me, I am learning but in life I am a slow learner. I have gotten a small board in, wired it to a display, it isnt a buck board that I have ever seen or used, its even smaller than the ones we are all accustomed to. I am confused, like I said above out of the box straight from the power supply its running 410 or so, through this tiny little board, at 11V its running 460, hmm I am sure there is something in the board that jacks its some how but I have no clue or understanding, as I said I am still learning. So for the most part of a whole day I dealt with that, got side tracked and delayed. I will be getting as many out as I can Monday and then the days after. @PPN My man, thanks for stopping by, been a while! Pls do keep an eye out, much to come! @anasrzi You gotta love wood bro! I am working on all that as far as a package, I still have not made up my mind just yet. I dont wanna say now what will or wont be, all that will come. Right now I am trying to work out my flow for just making the VB itself, there are many steps, in fact I was putting some together yesterday and I am so used to buttering last, once I had it assembled for the most part I looked down into the top of it and thought how the heck am I going to butter the inside properly with the air pathway and all that installed, ughhh, yeah I could probably twist a cloth with butter all over it and get it somehow inside but that aint cool so I gotta figure out the process. Hang in there with me! @KeroZen Thats right my man, get your popcorn out bro, the shows only getting started! @Gray Area Glad you like, I am most definitely going global with em, in fact one of my beta testers in in France, he is my main man! I am also sending one to my long time dealer there also in France for his take and to get some buzz going so that I can offer these in a large scale, been worldwide aint no point in stopping now! @phattpiggie Wow I have been holding that maple, just moving it slightly up and down, the thing shimmers and shines, over here when I was a kid you could get these baseball cards that would change when you moved them slightly either way, it so reminds me of them the way it POPS, glad you dig it bro! @CarolKing Come by anytime, ya know we will get right! @u bwade wunner Hello bro, good to see you stop by! Thanks for the kind words, I am running a SS cartridge heater, no resistor, no way, feel its a solid choice. @ZC I appreciate it and you! @Madcap79 Going to be a heckofa line aint it! @NickDlow Omgosh, I can only imagine, your girl is going to kill us both! @vakedcow Thats what I working towards! @little maggie Lol, oh my, I am trying, still got my eye out for that human cloning company, you do the same, when ya run across one let me know, will have to see what they can do for me! @Aezhenn You gotta love an adventure, thanks much! @Diggy Smalls Hope you can too bro, hang in there! @sickmanfraud Thank you sir, I am not sure what you mean switching PS, I dont want to run 110, this is 12V that I am figuring can be converted by an adapter to other power sources, like I said all I know is US 110, yeah I have been to Europe and know the electric system is different, not certain how so, one thing I do know is when I was in Belgium in 2000 my sister had an adapter, figure it wasnt such a great one, it caught on fire and freaking burned up the side of the wall, not cool! I dont wanna do 110 for the vape itself due to the risk, anything can happen and it generally happens to me, I dont want anything I do of this nature to harm anyone in any way or another. I feel 12V is best! Alright, I hope I have been helpful, I am back out in the shop just shortly, wish you all the best! ichibaneye, SSVUN~YAH, RUDE BOY and 27 others like this. Don't know how this thread got past me. SSVUN~YAH, RUDE BOY, Vapor_Eyes and 10 others like this. Ditto on what @Melting Pot said.. cant wait to see how things go! SSVUN~YAH, Vapor_Eyes, PeteSeattle and 7 others like this. I had always wondered when you'd get around to this one brother! Glad to see you're still going with the vapor bomb! From your description, it sounds like the airpath will be an all SS one, does this mean there is no section of the vapor path that is wooden? 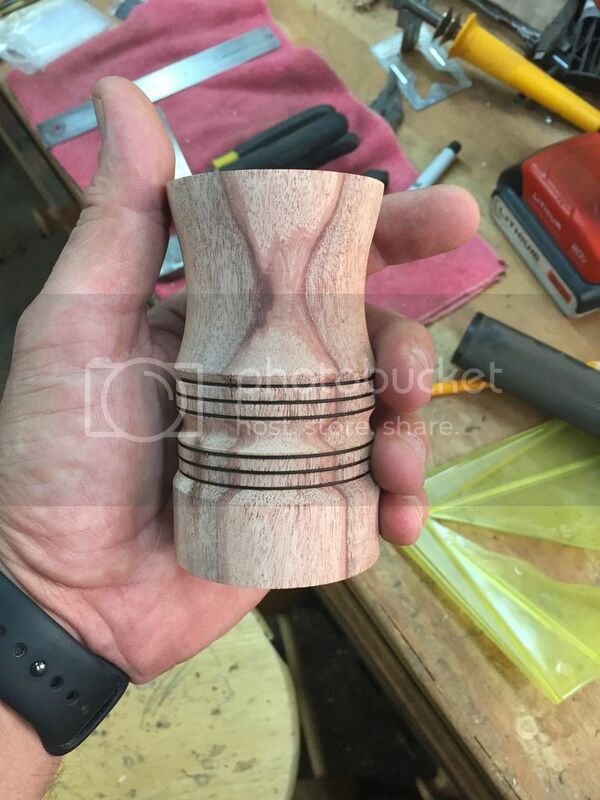 This is a very good idea, I found that I lost a lot of resin to wooden parts of airpaths over time in my favorite wooden vapes! Glad to see you blazing trails with this idea sir! My very best to you and yours! I've admired your work for a while and once regular orders for these are going out I'll be very interested. Vapor_Eyes, Ed's TnT, Aezhenn and 2 others like this. Good morning, I hope all is well out there! Ok so I said it earlier I am a couple days behind, like thats any different, not too bad though, better than never right! I have 3 betas going out this morning, I will have more going out this week till I get them all out by the end of the week. I have not quiet figured out what all will be in a package, I am working on a price structure and such. I have a mock/prototype VVPS made and working properly, parts on order for a couple more to be certain it works as I would like. Once I have a couple up and running those will go to production. I shot a couple of the 3 yesterday evening, got that late sun going down on em, you so gotta love stripes. Hope you all like, should have findings soon! I have used cork for the bottoms. @Melting Pot How could this be bro, glad you are on board now! @Reflections Gosh you been riding in the same boat, lol, thanks for stopping by! @herbivore21 Wow brother, been a long long time, yes I am glad to have gotten this going bro, about damn time huh! Yes you can see the above internal view, its nothing more, nothing less. Good to see you and thanks for stopping by, I hope all is well your way! @j-bug Hang in there with me homie! I hope you all like what I have done and look forward to your comments! cycleb, SSVUN~YAH, scottg402 and 29 others like this. Vapor_Eyes, VegNVape, CarolKing and 8 others like this.